As any serious gamer knows, the most important part of game play is the interaction process and the level of immersion which can be achieved. 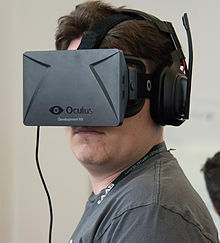 Traditionally, game developers have accomplished this by modifying controllers and toying with perspective, but it is with head mounted displays (virtual reality headsets) that true immersion is achieved. However, for Palmer Freeman Luckey of California, there was a discernible gap in the market for a headset that was truly immersive. From the age of sixteen Luckey used the money generated from fixing mobile phones, working at a sailing centre and doing odd jobs to buy a variety of head mounted displays at auction and even after attaining a collection of over fifty six head sets, still couldn’t find one that was perfect. The most frequent problems that took away from the total immersion Luckey desired was the low field of view and high latency (visual tracking) and it was this he sought to change. In Luckey’s own words he wanted to: “create a rift between the real world and the virtual world”. Luckey didn’t just want to create a genuine rift for gamers though, but an affordable one. The majority of head mounted displays that were in the price range lacked the total immersion whilst the high end equipment cost $20,000 and were often withheld for scientific or military procedures. There was simply nothing available on the market for the standard VR (virtual reality) game player, but as it was to be seen, Luckey was not the type to let that deter him. After dabbling with the premade headsets he’d bought, Luckey finally bit the bullet and built his own original prototype at the age of 18. Featuring a 90 degree field of view (unlike the typical 60 degrees of other head mounted displays) with an additional six degrees of freedom (or ultra low latency) Luckey’s prototype dubbed CR1 was the initial step to what is today known as ‘The Rift’ by Luckey’s company Oculus VR. Via the Kickstarter website Luckey began to sell Rift prototypes in a self-build format, in order to raise the money towards getting further help from developers. Offering demos for gamers to test The Rift, Kickstarter became the perfect platform to engage with the gaming world, and the Rift prototype generated $2,437,429. Whilst Luckey continued to explore and develop his prototype he would frequently update fellow VR enthusiasts via the online forum MTBS3D and it was there that prominent game developer John Carmack requested a prototype. Making some additions to the prototype himself, Carmack then demonstrated The Rifts capabilities at the E3 2012 and from there the Rift leapt from being Luckey’s big idea to a viable gaming opportunity. Suddenly the Rift was generating much more interest than Luckey could ever imagine, ultimately including the likes of well known names in the industry Brendan Iribe (who would eventually become the CEO of Oculus VR) and Michael Antonov (who would go on to develop The Rift software). Dropping out of college in order to focus on his project fully now, Luckey also conducted some demo’s himself at events such as Quakecon and also to Valve which resulted in backing from Valves MD, Gabe Newell. The aftermath of such unprecedented success was Oculus VR becoming a physical presence in Irvine California with a whole host of developers and co founders. Today the Rift as a concept is available in DK1 and DK2 development kits with the plans to unveil a commercial product in 2015.The latest version of the Rift released in September 2014, known as the Crescent Bay is a lighter, more impressive version of the DK2 development kit, sporting an independent audio system and 360 degree tracking. After such a storm of success Luckey was also gifted with the coveted Smithsonian Ingenuity Award in November 2014 and there has also been the recent announcement that Oculus is being bought by another entrepreneur, Mark Zuckerberg of Facebook. This union means that Oculus technology like The Rift won’t be limited to just gaming but long distance social interactions. This new world of virtual reality allows for the kind of social interaction that was once a thing of fantasy, but more astonishing still is that such an incredible leap forward in technology like the Rift was born from a young man not taking no for an answer and tinkering in his parents garage.